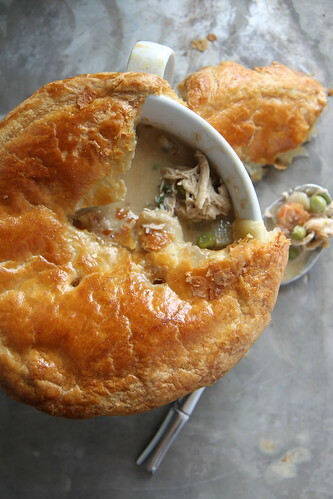 I made this Chicken Guinness Pot Pie in honor of St. Patricks Day which is fast approaching. **This serves 8 people in a full to the brim 9×13” baking dish. I made this recipe a second time and used 4 HUGE “individual serving” dishes (pictured). Worked beautifully. 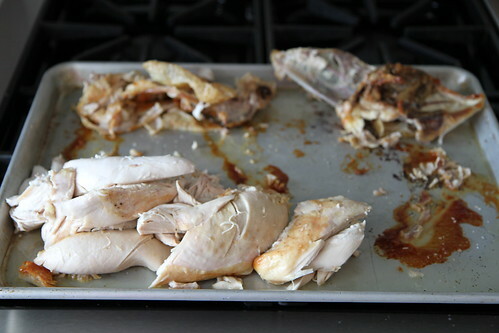 Put the three chicken breasts on a sheet pan and sprinkle generously with salt and pepper. 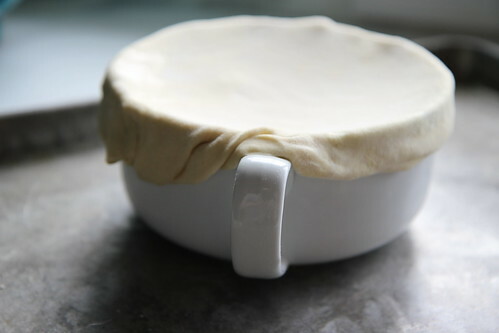 Remove the puff pastry from the freezer, and set it out to thaw while you make the pot pie filling. Using the 1 Tbs of butter, grease a 9×13” baking dish. In a large heavy pot, melt the ¼ cup butter over medium heat. Add the onion, sprinkle with a little Kosher salt and cook over medium heat until the onion is soft. 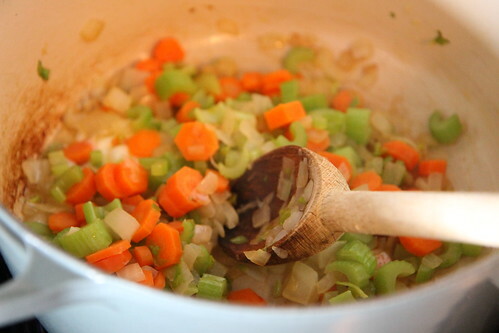 To the butter and onions, add the carrots, celery, potatoes, peas and pearl onions. Sweat for a few minutes until they start to soften. 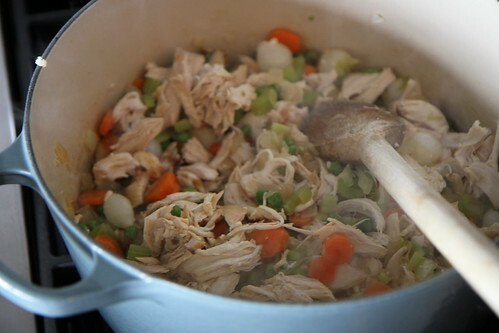 Add the chicken pieces to the vegetables. Add the guinness and let the vegetables and beer sweat for about 5 minutes, until everything is hot and tender. 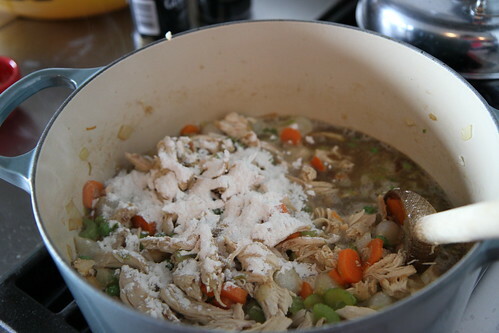 Add the ¼ cup of flour and stir it into the vegetables. 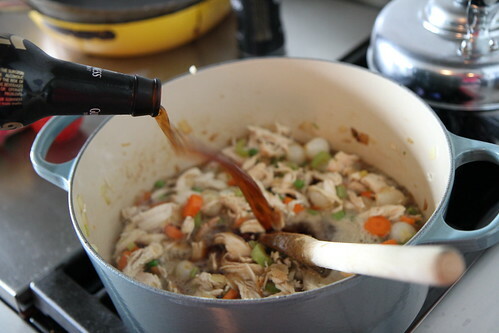 It should absorb some of the beer and butter and will help to thicken the sauce. Cook for about 3-5 minutes to get rid of the raw flour taste. Add the 2 cups of chicken stock , the cream and the fresh thyme leaves. Stir the filling and let simmer with the lid on for about 10 minutes. 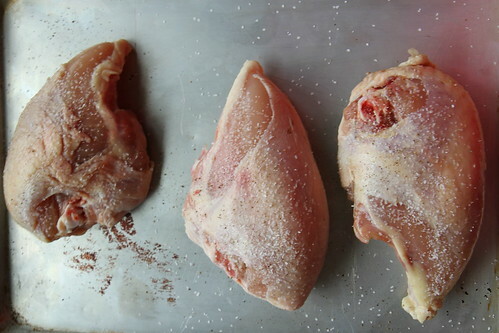 Season with salt and pepper to taste and then pour the filling into the prepared baking dish. Using the puff pastry sheets, make a tent over the filling, simply pinching the puff pastry to the edges of the dish to hold it in place. Cut off any extra dough that hangs too far over the sides. Take the egg, and beat it with 1 tsp of water. 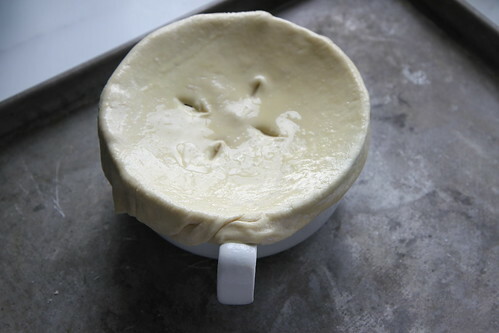 Lightly brush the egg wash over the puff pastry so that it will have a nice sheen to it when it is baked. Slice some steam holes in the top of the pie. Carefully put the pot pie in the oven and bake at 425 for about 20 minutes, or until the insides are bubbling and the puff pastry is golden brown. Add the 2 cups of chicken stock, the cream and the fresh thyme leaves. Stir the filling and let simmer with the lid on for about 10 minutes. 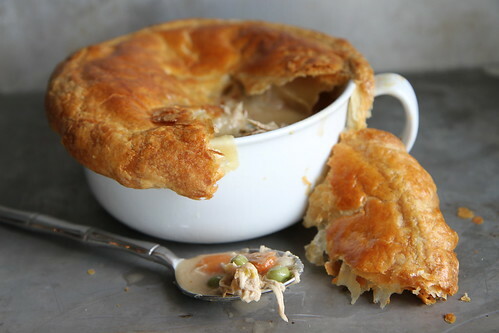 This is the second chicken pot pie recipe that I’ve seen this morning, and a craving has officially set in…this looks delicious! Maggie- this one is Uniquely flavored, and I swear- one of the best I have ever had! Go Guinness! Love the crust on top! Beautiful! Brilliant!! This is gorgeous and looks absolutely amazing Heather! Yummy. This looks so decadent and rich! I’m really glad I bought that Guinness at the store yesterday… it must have been some sort of premonition or forethought about this baked beauty. YES!! and I have more guinness recipes for next week! Sounds delish with the Guinness! The golden crust looks yummy too. heather, that pot pie looks soo comforting! 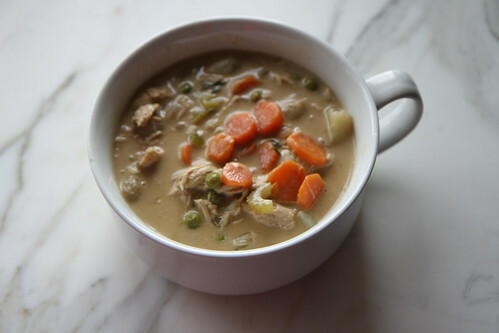 it’s one of my all time favorite comfort foods but i haven’t made it in a while. thanks for the inspiration! do you deliver? this would be the perfect Friday night meal. And I so love the addtion of booze in the pie!! Great photos, Heather! Thanks Susan. 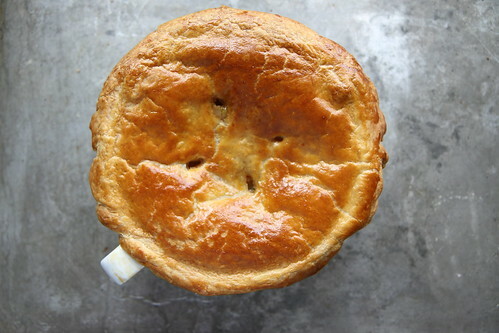 I finally got a new camera- and that pot pie was one of my first photog sessions! Beautiful pot pie, Heather! This looks fabulous!! It’s an oven proof individual baking dish. But some mugs would be able to withstand that kind of heat. It will always say on the bottom. I love cooking stews/soups with beer and wine. It gives so much flavor! I would never have thought to add it to chicken pot pie, though. I’m excited to try this! This came at the perfect time! I’m toying with pulling together a Guiness inspired post, and yours would be lovely to add to “the party”. I love everything about this – the stout, the pastry on top, and the filling. Yum! You’re pushing all the right buttons with this one, Heather. Oh, my. 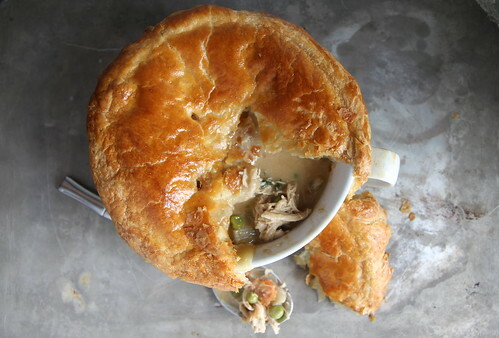 I would never have thought to use the stout with a CHICKEN pot pie. You most always see it used with beef or lamb. 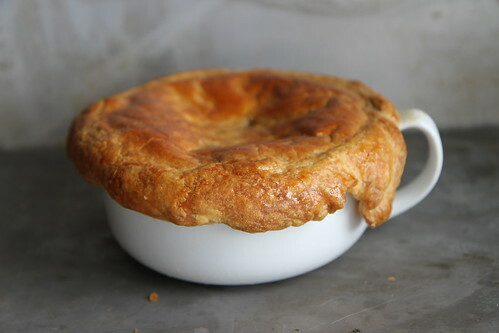 I think this is very much a SPRING pot pie – a little lighter than one made with beef and a heavy, dark gravy. And the photos with your new camera are really excellent – very crisp on the screen. I’m trying to get my farm blog up and running and I need to buy a new camera – what kind of camera did you get if you don’t mind me asking? I got a 7D- with a 17-55 lense. it was quite an upgrade, but I love it! These look incredible! I am 1/2 Irish and I haven’t made anything for St. Patrick’s Day yet. Maybe that needs to change asap! These look so amazing, Heather! 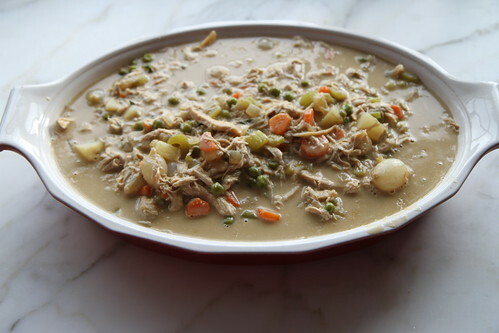 I love chicken pot pie, but my husband won’t eat it so I never make it. 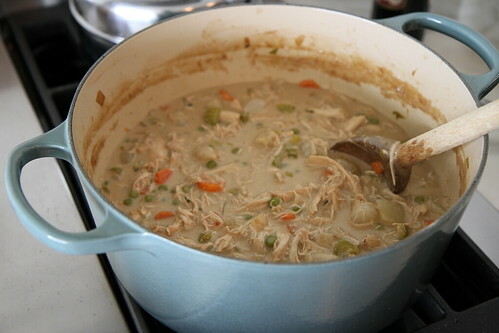 I’m going to need to just make and freeze some, you’re definitely making me crave pot pie now! Perfect recipe for these cooler nights! Sound like such an interesting flavor combination to add Guiness! I found this on the tasty kitchen site and had to make it for our St. Patrick’s meal. It was so good. Thank you! This looks soooooo fabulous. Glad I found you on Blogher! Can’t wait to try some of your recipes. Could you please clarify the recipe? It calls for boneless, skinless breasts but obviously there are bone-in breasts in the pictures and you later refer to discarding the skin and bones. 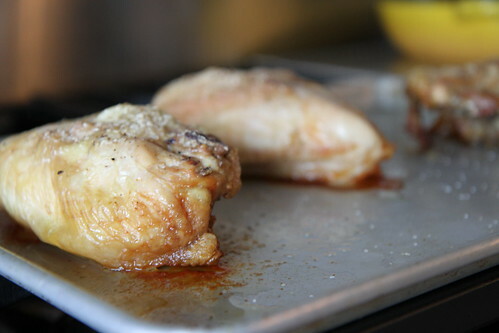 If I use boneless breasts, won’t they be extremely dry after 40 minutes in the oven? Otherwise, looks lovely, looking forward to trying! brilliant Sara- thank you- it was just a weird typo! THANK YOU!! Since this calls for frozen peas & pearl onions, is there any reason one couldn’t use frozen mirepoix instead of fresh onions, carrots & celery? Nope! Go for it Kate! with meat please pass it on. (no pork,or fish please,I hope you have a recipe,would love to try it. I have been looking for, for years. I can’t wait to make it. I am going to get some chicken and then I am going to have a lovely time making and serving this to my husband. Thank you for this recipe. Please send more. I really appreciate real food. Hi Janice- I just fixed it, it should print just fine now. Some of my older recipes just aren’t formatted for it and I missed them when things were updated, but I go back and change them when people point it out. If you have a problem in the future- just let me know!